Many of you don’t need convincing that online marketing works. SEO, content marketing, and social media are proven techniques for generating leads online. But for professional services firms already generating leads via traditional marketing tactics, is an online focus really necessary? If you are an architect, accountant, lawyer, or other professional service provider, you’ve got to decide whether an investment in online lead generation is really going to improve your marketing. After all, you can’t afford distractions that will waste your time and money. Take a look at firm growth rate, represented in blue. Firms generating 0% of their leads online are growing at the lowest rate. Growth rate peaks when about 40 – 60% of leads are generated from online sources. 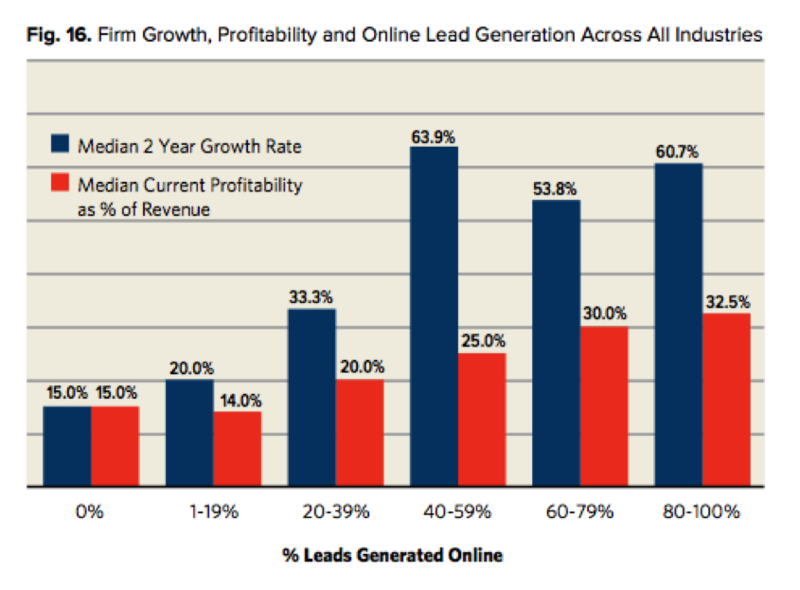 Interestingly, as the percentage of online leads increases above 60%, growth rate levels off. This tells us that going all digital may not be the right solution—it takes a mixture of online and traditional marketing tactics to grow at an optimal rate. Now direct your attention at profitability, depicted in red. There’s no question here that firms generating more leads online are also more profitable. This relationship makes complete sense to anyone who’s experienced the effects of a successful inbound marketing campaign. Once your online marketing engine is up and running, search and social media become the gifts that keep giving (without ongoing costs associated with traditional advertising, tradeshows, and direct mail). The case is clear: online lead generation can help your firm grow faster and be more profitable. But let me be honest—not all firms can pull this off. Many marketers give online marketing a shot and fall on their face. 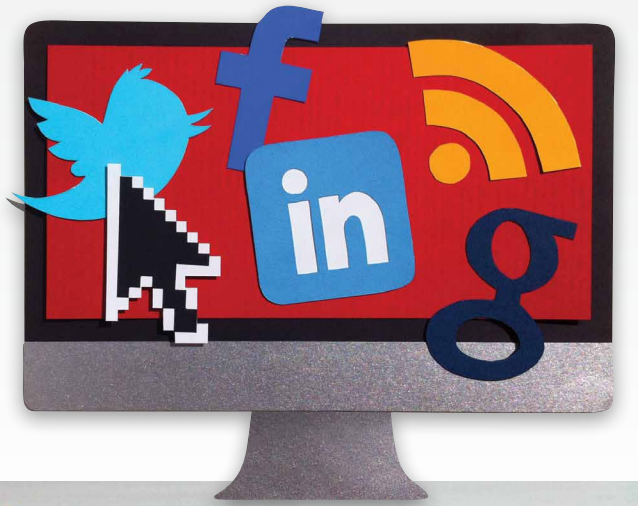 So what makes for successful online lead generation? Firms fail at online marketing when they don’t treat it as a legitimate marketing initiative. Having an intern set up a Facebook account and test a $50 Adwords campaign is not going to produce results. Successful firms understand that online marketing is a serious investment that takes serious resources and time to pull off. Don’t give up if you aren’t swimming in leads after your first blog post or tweet. Instead, invest in a long-term plan. Making a serious investment doesn’t mean you have to abandon the marketing you are already doing. Word-of-mouth marketing, networking, and other traditional marketing tactics still have a place. As you saw in the data, firms that obtain half of their leads online tend to grow the fastest. Experiment with your balance until you find the right mixture of marketing channels—both online and offline. Jumping into online marketing doesn’t mean taking it all on at once. The research indicates it makes sense to tackle certain online marketing techniques before others. For example, it may be more effective for your firm to focus on producing educational content before you invest too much time networking on LinkedIn. Once you have built up a portfolio of content, your reputation and credibility as a thought leader will be much more robust. If you’re interested in learning more about how online marketing can work for your professional services firm, I recommend downloading a free copy of a new book titled Online Marketing for Professional Services. Based on the Hinge Research Institute research study, this quick read will help you wade through the mass of online tools and formulate a practical plan for online lead generation. Let us know what you think! Sean McVey is the Director of Online Marketing at Hinge, a branding and marketing firm specializing in professional services, and co-author of the book Online Marketing for Professional Services.